Truckee's girls stand on the top of the podium after winning the Northern Division I-A regional title. The Truckee girls reminded their cross-country foes who — until rightfully unseated — still owns the Division I-A crown. 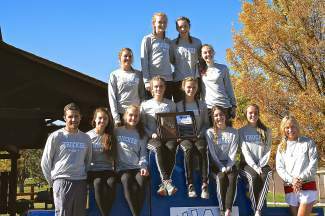 In their mission to earn a third consecutive state championship, Truckee’s girls topped the field at the Northern Division I-A regional championships at Reno’s Rancho San Rafael Park this past Saturday. With a team of all juniors, the girls placed two runners in the top three and all five of their point-scorers in the top 11 to run away with the regional title. They posted a low score of 28 points to second-place Spring Creek’s 52 and third-place Elko’s 76. Truckee’s boys did not make the state cut as a team but did qualify two individuals to run in the championship meet. Kacie Bell, a junior from Elko, claimed the girls individual regional title ahead of Truckee’s Brenna Wapstra Scott and Carrie Bradley. Bell covered the 5K course in a time of 20:26, while Wapstra Scott finished in 20:37 and Bradley in 20:50. Claire Lang-Ree followed her Truckee teammates with a fifth-place finish in 20:59. Amanda Rae (21:25) and Julia Veliquette (21:47) rounded out the Wolverines’ team score (top five) with seventh- and 11th-place finishes, respectively. Syra Fillat followed closely in 12th (21:51), and Lily Robertson was 15th (21:56) in the field of 49 girls. Aside from Spring Creek and Elko, the Truckee girls figure to be challenged at the state meet by Faith Lutheran, which won the Southern Division I-A title with 35 points to runner-up SECTA’s 56. Boulder City, which recorded a team score of 100 points, earned the third state seed from the South. Truckee’s boys finished fifth as a team with 113 points. Spring Creek won the boys regional title with 45 points, Elko was second with 57 points and South Tahoe, with 85 points, earned the third and final state seed. In addition to the top three teams, the top five individuals from non-qualifying teams also qualified for state. Truckee juniors Ian Smith and Hudson Verbeck were among those top five — Smith with a 10th-place finish out of 54 runners, in 18:12, and Verbeck with a 20th-place finish in 18:58. Smith and Verbeck were followed by teammates Calin Laine in 25th (19:08), Ryan Murphy in 26th (19:20), Jordan Guldman in 32nd (19:47), Jenner Tresan in 34th (19:57) and Tyler Ferrera in 47th (21:01). Cole Campbell, a junior from Spring Creek, captured the regional title in 17:25 and was followed by Tristen Thomson of Fallon (17:44) and Timothy Rose of Elko (17:47). The state championship for all divisions will be held at the same venue as regionals, Reno’s Rancho San Rafael Park, on Saturday. The Division I-A girls race starts at 10:45 a.m. and the Division I-A boys at 1:20 p.m. Check the NIAA website for complete regional results.